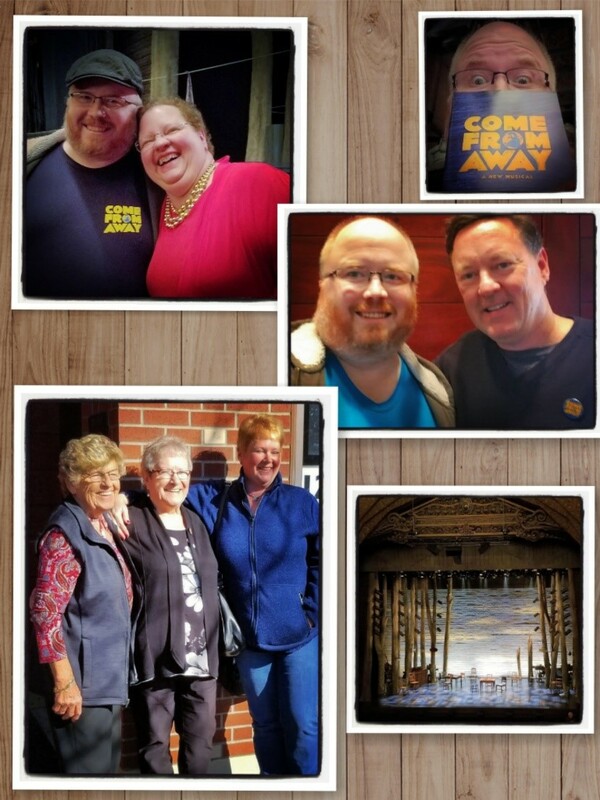 My Personal Year in Review — All Things Broadway: Where the fans and stars align! As 2018 comes to a close (already?! ), I thought it would be nice to look back on the musicals I have seen in the past couple years. Looking at the list, nearly all of them are based on, or at least inspired by, real events. Some were live onstage, while several of them were on Fathom Events in movie theaters. In no particular order, these are the shows that stand out in my memory. This musical by David Byrne and Fatboy Slim tells the story of Imelda Marcos, former first lady of the Philippines. Having grown up in the Philippines in the 80s and early 90s, there were parts of this show that I remember experiencing. A friend got me a ticket, and I wasn’t sure what to think about the “standing room” tickets that we got. I was particularly surprised to notice in the lobby that the “standing room” tickets were the most expensive at the Seattle Repertory Theatre. Having not seen a show at that venue in the past (also where Come from Away performed its pre-Broadway shows, which I missed), I was not quite sure what to expect. I was told we would be onstage, and that people would be directing us where to go as the actors performed. This confused me, as I wasn’t sure if we might be blocking the audience from seeing the show. As we entered the theatre, they handed out glow-in-the-dark earplugs, warning us that it would be very loud, and we would need them. We were ushered into a fairly small rectangular room with a large disco ball in the middle hanging over a long table spanning nearly the width of the room. Spotlights were everywhere, and there was a family portrait of the Marcoses projected on one wall. At first I thought we would go from there into the theatre. Then I realized this room was the stage. The seats are on balconies above the stage, looking down on it. As the show started, the disco ball rose up to the ceiling, and the DJ introduced the show from his raised box in one corner of the stage. On the opposite end of the stage, a woman said, “Excuse me” and brushed past me as she climbed the steps to that part of the stage to join the young Imelda, already on stage. A tropical downpour was projected on the wall behind the actresses as we got to know Imelda and her childhood friend Estrella on the eastern Philippine island of Leyte. As the story progressed, we saw her growing relationship with Ninoy Aquino, who was more interested in politics while she was interested in fashion. She joined a beauty pageant and became the “Rose of Tacloban.” (Tacloban is the capital of the island province of Leyte.) I was fascinated with the quick costume changes during that song that they didn’t even try to hide, as she went from one beautiful Philippine dress to another, with stagehands donning new costumes on her. Eventually, her relationship with Ninoy was interrupted when she met a certain Ferdinand Marcos and dated and married him in short order. On their honeymoon, they danced on the beach, or in our case, what I initially thought was a long table when entering the theatre. This was also the first time I have seen someone dancing in tsinelas (flipflops). I was fascinated by the interesting footwear, and was then fascinated that I had to stop and think of the English word for it. As the story continued, we learned about their turbulent marriage and the political rivalry that grew between Marcos and Aquino. Marcos would eventually declare martial law [side note: the period of martial law was when we moved to the Philippines], and Aquino’s outspoken opposition to it got him arrested and imprisoned. (A wheeled stairway was turned backwards and became his cell.) Imelda visited him in prison and encouraged him to move to America to escape all of this. He and his family moved, but he couldn’t stay away. In an emotional farewell on the tarmac in the US, he sang good bye to his wife Corazon and son Ninoy III, and climbed the stairs. The staircase that had been his prison cell was now the stairway to the plane, and then the stairs off the plane in Manila at what would eventually become known as Ninoy Aquino International Airport. As he started to descend the stairs, there was a loud bang, flash, and he slumped over as the lights went dark. His mother Aurora Aquino sang a mournful song, dressed in black and carrying a black umbrella, as the mourners crossed the stage. His assassination in 1983 played a major part in the people rising up in the bloodless 1986 People Power Revolution to elect a new president, Corazon Aquino, and force the Marcos family into exile in Hawaii. Imelda mournfully wondered why the Philippine people no longer loved her, and her estranged friend Estrella wondered the same thing about Imelda. With the Marcos family gone, the DJ came down to the stage and sang the final song, accompanied on his guitar. The company then returned to close the show. Throughout the show, the stagehands, wearing glow-in-the-dark pink and holding glowsticks, directed those of us in the onstage audience around the stage as stages, tables, and other set pieces rotated and were otherwise moved. By the end of the show, most of the stage and “long table” had moved to one end of the stage. For Aurora Aquino’s song, she and fellow mourners were on a part of stage that was slowly transported from one end to the other as the song continued. After that, the performance was on the bare floor on the end of the stage that no longer had raised stage pieces. Throughout, the action was all around us and we had to turn around and move to take it all in. The news media was represented by reporters and cameramen, and as the cameramen filmed, their cameras projected the footage on the wall. Throughout, people were identified by their name on the walls, similar to how they would be identified in a news report. The years and locations were similarly projected on the walls. It was a powerful show, and the staging was unlike anything I have experienced elsewhere. Thus far, it has played in New York, London and Seattle, and last I heard they were hoping it will make it to Broadway. I hope it does. In some ways it reminded me of Miss Saigon and Evita, and was more powerful for me because I remember some of the events in the last few minutes of the show. In 1986, we got a vacation from school during the People Power Revolution because it was too dangerous for us to be out. This show is more familiar to the Broadway community, so I will not go into the plot as much as I did with Here Lies Love. It was inspired by several sources: primarily, a heartbreaking photo of a Vietnamese woman at the airport saying good bye to her child to give them a better life. It is also inspired by Pierre Loti’s novel Madame Crysanthème and the opera that book inspired, Giacomo Puccini’s Madama Butterfly. I saw the London cast as filmed for Fathom Events to celebrate the 25th anniversary of the musical. It tells the story of Christopher Scott, an American marine stationed in Vietnam at the end of the war, and his relationship with Kim, a Vietnamese teenager who fled an attack on her village and found a less than desirable job in the big city. Chris and Kim spend an eventful night together, and just like that, Saigon falls and he is forced to leave without her. Three years later, Kim finds herself in Bangkok trying to provide for her young son Tam and absolutely certain that Chris will come back for her and their son. Chris, meanwhile, convinced he would never see Kim again, has remarried and is building a life with his new wife Ellen. Ellen is bewildered by Chris’s nightmares, and they are further shocked when they learn that Kim is still alive, and that Chris has a son. Chris and Ellen go to Bangkok, and though a series of unfortunate circumstances, it falls to Ellen to tell Kim that Chris has now remarried. Kim wants to send her son to America with his father, but Ellen feels it would be better for the child to be with his mother. Kim takes decisive measures to ensure that, by her sacrifice, Tam will have a better life in America. There was an intermission between acts (the first time I have experienced this at a movie theater), and then a second intermission after the second act. After that, they showed the 25th Anniversary celebration. The original cast (as many as could come) were there, and Lea Salonga (the original Kim) sang a duet with the current “Gigi” of “The Movie in My Mind.” Lea also did a duet with Simon Bowman (original Chris). The composers were there as well. This is an emotional and powerful show, and having grown up in Asia, it also resonated with me with the Asian elements. I have not been to Saigon/Ho Chi Minh City, but I have been to Bangkok (though not the parts of Bangkok portrayed in the musical). Before moving on to the West End and Broadway, Lea Salonga was popular in the Philippines, so I grew up hearing her. Though I do not recommend this show for children, it is very powerful and moving. My eyes were watering at times watching it. This has played on Fathom Events in movie theaters several times. I highly recommend it, as it is very educational, and it is about a part of our history that was not taught at length in school. While almost all the characters are fictional, it is inspired by George Takei’s memories of being in a Japanese internment camp during World War 2. The way they were treated was shameful, and I believe everyone needs to watch this to make sure we do not repeat this dark part of our history. It is an inspirational story of never giving up on family and treating all humans with dignity. It teaches the Japanese concept of gaman (我慢), or holding up in tough times in a patient and dignified manner. George Takei, Lea Salonga, Telly Leung and the rest of the cast shone. The show was followed by a documentary about the internment camps. There’s so much we weren’t taught, so much we need to know. The next time this airs, please do yourself a favor and go see it. This is a parody of the Harry Potter story, following the saga through the events of all seven books from the perspective of the Puffs. (The houses are renamed, probably to avoid copyright issues. They are the Snakes, the Braves, the Smarts and the Puffs.) Wayne lives in the US and is surprised to get an owl telling him that he has been accepted at Hogwarts in the UK. He had no idea his parents, who he never knew, were British. It skims over the highlights of the seven books, as the Puffs are constantly outshone and outdone, but they do their best to make their contributions despite being underappreciated. While this is not Harry Potter canon, I think I will leave the plot description at that, as it is important to #keepthesecrets with all things Harry Potter. This play was filmed off-Broadway, and I saw it on Fathom Events in a movie theater. It is a fun show, particularly enjoyable for fans of the books that inspired it. I’m not sure how well people who do not know the story would understand what is going on, but I’m sure they would still enjoy it. The cast is small, with most actors playing multiple roles. It’s similar to Come from Away in that respect (though that’s probably the only similarity). The stage is also surprisingly small, considering the sweeping scope of the story. In a way, that kind of highlights how the Puffs are small and underappreciated (underrated? ), but their value is much greater than it appears. Disney came out with their movie about the 1899 New York newsboy strike while I was in high school. My freshman year in high school we did a Disney revue and performed “King of New York.” So I was excited years later when they did a Broadway version, and was further excited when I found out they were filming a stage production with the combined touring cast and members of the original Broadway cast. This was an opportunity I could not pass up. As with all Disney’s Broadway shows based on movies, they added songs and plot elements. For example, the characters of Denton and Sarah (Davey and Les’ sister) were combined into Katherine, daughter of Pulitzer. Medda Larkin, the “Swedish Nightingale” in the movie, was decidedly not Swedish in the Broadway version, but just as amazing. One of my favorite moments in the movie is where they sing near the beginning, “When you’ve got a hundred voices ringing, who can hear a lousy whistle blow?”, and then that changes later on to “When you’ve got a million voices ringing, who can hear a lousy whistle blow?” A stage production can’t replicate the large crowds they can have in a movie, so that didn’t have the same effect on me; however, what did give me similar chills was the new song “Brooklyn’s Here.” Up to that point, the newsies’ attempts to gather support from other groups depended on the response from Spot Conlon and his group of Brooklyn newsies. Once they respond in support, the other boroughs join in. This is a powerful story of what can be accomplished by a unified effort. I also liked the way the Broadway version incorporated Teddy Roosevelt better than the movie. This is the show that taught me that it might not be wise to listen to a cast recording of a musical comedy for the first time in the car while driving down the freeway. I tend to shut my eyes when I laugh hard. Yeah, not a good idea while driving. I managed to keep my eyes open, but it was a challenge. “A Musical” was the song that did me in. So of course, the theatre being a much safer place to be doubled over laughing, I jumped at the opportunity to see the show when it came to Seattle! It was absolutely worth it. The rivalry between Shakespeare and the Bottom Brothers was like no other. Throw in Nostradamus and an attempt at stealing an idea Shakespeare will have in the future, and you get an omelet! 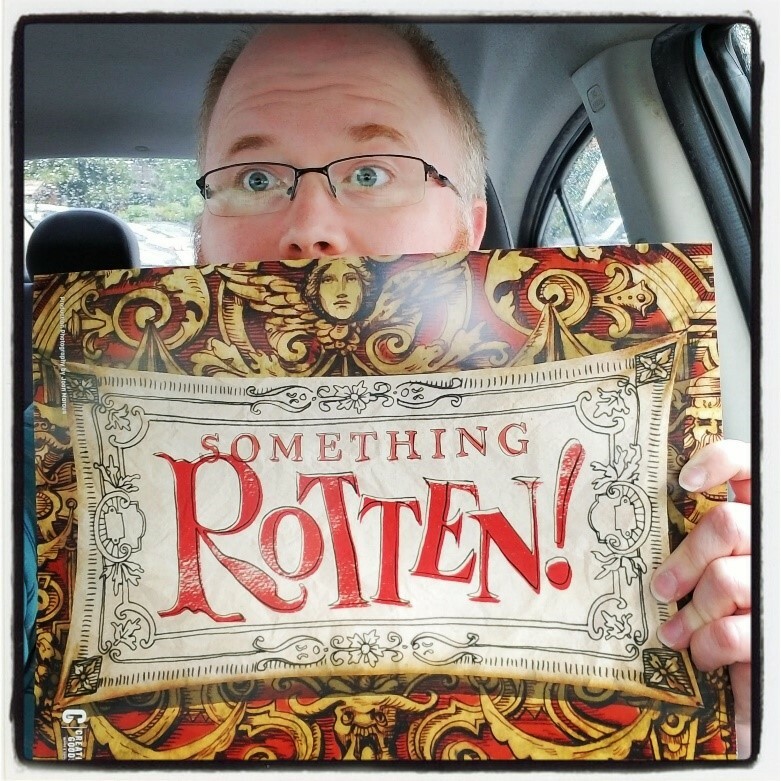 The nods to other musicals and constant parodies and puns made for an evening of hilarity. Adam Pascal was brilliant as Shakespeare. I highly recommend this show if you get the opportunity. The show follows the life of Alexander Hamilton, from his early political life, to his death in a duel with Aaron Burr, sometime after his son’s similar death. It follows his romance and marriage to Eliza Schuyler, with twists and turns along the way, as well as his contributions to American politics and history. It is a powerful musical, and I highly recommend it. (“Immigrants: We get the job done!”) I would love to see it again. (King George was probably right. I’ll be back. Da da da da da da da da da da-ya da!) I would also say it is worth it just to see Lafayette rapping in a strong French accent. Taproot Theatre, one of Seattle’s premiere community theatre groups, put on the lesser-known musical Crowns, which is about the African American experience in the South. Yolanda, a city girl from Brooklyn, visits, and six women (and one man) tell her their stories with the hats (or crowns) they wear to church and elsewhere. It is a joyful and moving celebration of the human spirit, and Yolanda is slowly changed over the course of the show. I recommend it. I have gone into detail on the plot and songs of this show in previous blogs, so here I will focus more on my experience, most of which happened after my post in August. Interviewing the people who inspired the show gave me a new perspective on the tragedy that I remember, and the way others responded to it around the world. I now count several of them among my friends. 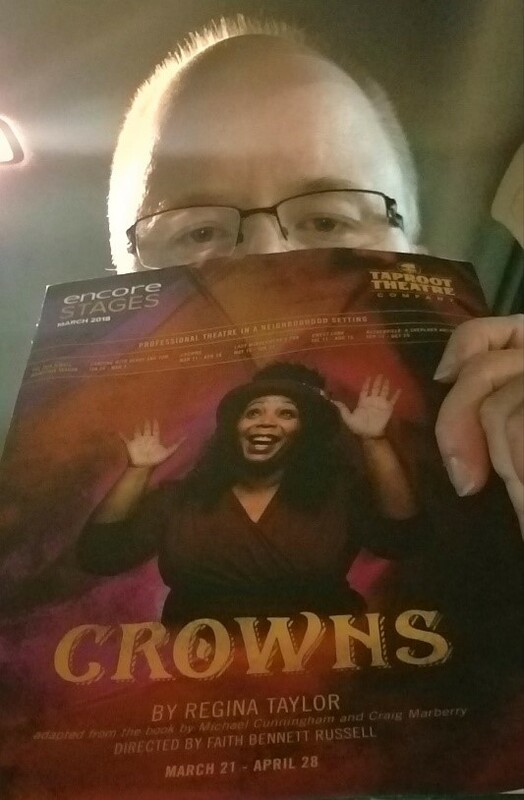 Our Bible study group from my church decided to go to the show during its run, as there are many lessons in the show that express a biblical view of how to welcome strangers with open arms (that far too many of my fellow Christians seem to have forgotten, but that’s another matter). Our group leader is a subscriber at the 5th Avenue Theatre, and bought tickets for us, that we were going to need to pay back. However, she asked that we wait to pay her back because an anonymous donor had offered to cover part of the cost. She was blown away when said donor ended up paying the ENTIRE cost for our group to see it! I still don’t know who paid for us to see it, but if you’re reading this, thank you!! Top: With Diane Davis; Middle: with Kevin Tuerff; Bottom: Hannah, Beulah and Bonnie. Having interviewed several of the people involved over the internet, I wanted to meet them in person. Kevin Tuerff invited me to a special screening of the HBO Canada documentary You Are Here: A Come From Away Story. He said I could invite a guest, so my brother came with me. It was a deeply moving documentary, and I am looking forward to it being available for US and international audiences. The experience was even more powerful sitting down the row from Kevin Jung, right behind Janice Goudie, Brian Mosher, Beulah Cooper and Hannah O’Rourke. Kevin Tuerff was a couple rows ahead of me. Before the show, I walked up to Nick and Diane Marson and introduced myself and thanked them for the interview. They then introduced me to Bonnie Harris, who was there with her sister. Afterwards, Beulah Cooper gave me a hug. I was amused that Oz Fudge was wearing an “STFD” t-shirt, as that’s his line in the show. I got to speak with Kevin Tuerff, who recognized me, and I took a picture of Bonnie, Beulah and Hannah. The only people not able to make it were Diane Davis and Claude Elliott, who had a conflict in Newfoundland, and Beverley Bass had to leave Seattle that morning, so couldn’t make it to the showing. The director and producer of the documentary were there. Sankoff and Hein were also there, but I didn’t get to meet them. The Seattle Public Library hosted an event in which a representative from the 5th Avenue spoke about his research and knowledge of the show and its background. He explained how Come from Away is only the third of a very small subset of musicals, one based on interviews. It is not based on any book, movie or anything else. All research by the composers was done by means of interviews at the 10th anniversary celebration in 2011. They compiled many hours of recordings that they used to build a 100-minute musical. (The other musicals based on interviews are A Chorus Line and Working.) Chelsea LeValley, who workshopped the part of Beverley Bass before the show went to Broadway, sang “Me and the Sky.” Two Seattleites who were stranded in Newfoundland after 9/11 then shared about their experiences. One landed in Gander, and the other in St. John’s. Both were welcomed warmly. One difference was that while they allowed passengers to take their carry-ons off the planes in Gander, they did not allow that in St. John’s. So the passengers there had to make do with even less. One of them remembered that before they were allowed to land, planes were circling, waiting for direction where to land. As far up and as far down as she could see out her window, she could see planes circling, like a tornado of planes. But everyone made it down safely. Our group from church went to see the show a few days later. Before the show, I attended a pre-show talk telling more of the background. We learned about how Sankoff and Hein met and got married. Their first argument was about whether or not music could change the world. They were Canadians living in New York when 9/11 hit, and that night they gathered around their piano with international friends and sang. It was very traumatic, but music and friendship brought them through it. The show was everything and more I had dreamed it was. It was deeply moving, and I just had to go again. It just so happened that my previous birthday, my family told me we would go as a family to a show, and I was supposed to name the show. Knowing it was coming and that I would want to see it more than once, I requested Come from Away. So the week following the first showing, I saw it again with my family. I was surprised when Caleb at the merchandise booth recognized me and asked if it was my second or third time. My family was equally moved by the show. Between showings, I had to go downtown to renew my car tabs. The man at the counter at the Department of Licensing saw my Come from Away shirt and asked me about it. He really wanted to see it, but he said his partner had been in New York at the time, and it was still too raw for him. He told me that his partner recalled being inside while everything outside turned black with the ashes from the fires and the rubble, and every once in a while, pieces of paper would hit the windows and blow away. Partway through the run in Seattle, I found out that Diane Davis was coming, having missed the opening. While the first two times I saw it were planned, this one was not. She told me ahead of time which shows she would attend, and I decided to try to see one of those shows. It was Canada Night. I arrived at the box office and asked if they had rush tickets, but the show was sold out. They told me to wait and see if any seats opened up. So, I waited outside the theatre while someone dressed in RCMP (Royal Canadian Mounted Police) regalia welcomed guests into the theatre. Just before the show was due to start, I returned to the box office, and a seat had opened up! It was even relatively close to the stage. The first time I was in the balcony, and the second time I was in the back of the orchestra level below the balcony overhang. This time I was in row K. It was close enough see the actors’ expressions. After the show, they had a talk-back with Canadian dignitaries, the person who commissioned the show, and others, including Diane Davis. I moved closer to the stage, and when Diane saw me, she mouthed, “Steven?” After the talk-back, Diane gave me a big hug and told me it was nice to see a familiar face. Now if you’ll excuse me, I have a cod to kiss. I don’t know when, but that must happen. These are the shows I have seen in the past couple years. What is next? My brother’s employer is sending a delegation to Dear Evan Hansen next month, and he invited me to come too! I can’t wait! I’m currently listening to the audiobook in preparation. (Well, not as I type, but I listen to it when I get the chance. 2018 has been an amazing year. It’s hard to believe it is almost over! I look forward to future adventures in theatre in 2019 and beyond, and I hope everyone has an amazing New Year! Steven Sauke is a Broadway enthusiast who took all the pictures above, attended all the shows featured in the past couple years, and can get long winded at times.